John G. Selby portrays a general bestride a large army he could manage well and a treacherous political environment he neither fully understood nor cared to engage. Meade’s time as commander began on a high note with the victory at Gettysburg, but when he failed to fight Lee’s retreating army that July and into the fall of 1863, the political knives came out. Meade spent the winter of 1863–64 struggling to retain his job while the Joint Committee on the Conduct of the War sought to have him dismissed. Meade offered to resign, but Grant told him to keep his job. Together, they managed the Overland Campaign and the initial attacks on Petersburg and Richmond in 1864. 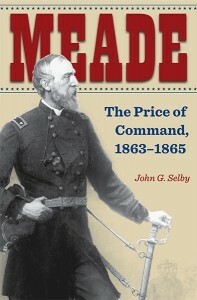 By basing his study on the Official Records of the War of the Rebellion, original Meade letters, and the letters, diaries, journals, and reminiscences of contemporaries, Selby demonstrates that Meade was a much more active, thoughtful, and enterprising commander than has been assumed. This sensitive and reflective man accepted a position that was as political as it was military, despite knowing that the political dimensions of the job might ultimately destroy what he valued the most, his reputation. AuthorJohn G. Selby is professor of history at Roanoke College and the former holder of the John R. Turbyfill Chair in History. A Civil War scholar, Selby wrote Virginians at War: The Civil War Experiences of Seven Young Confederates and coedited Civil War Talks: Further Reminiscences of George S. Bernard and His Fellow Veterans.